You are now the detective...In the game of Where in the World is Carmen Sandiego. Now detective, your task is to extract clues from Carmen's accomplices around the world to find out their fake identity. Your task: obtain a warrant for the criminals arrest, capture the criminal, and find the stolen items.Think your task is going to be easy? Where in the World is Carmen Sandiego? is a board game that brings together mystery and geography in a way that will have both kids and adults hooked. Answer questions to move around the board and get closer to finding the criminals hideout. 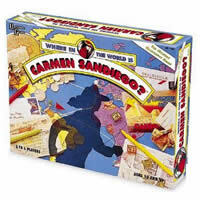 Check out Where in the World is Carmen Sandiego for a fun and educational game for the entire family. The game has two parts. In the first part, players collect clues to figure out which one of Carmen's V.I.L.E. henchman stole a famous landmark. In the second part, player track the thief to his/her hideout. The first player to reach the thief's hideout wins the game Where In The World Is Carmen Sandiego. Where In The World Is Carmen Sandiego will have the game board, solution key, 226 question cards, 8 clue cards, 6 V.I.L.E. henchman pieces, 6 acme detective pieces, 6 warrant / escape cards, 12 V.I.L.E. henchman stickers, 12 Acme detective stickers and the Where In The World Is Carmen Sandiego game rules and instructions. Please keep in mind that the official Where Is Carmen Sandiego board game rules and instructions could be different depending on the game version you have. The rules below are some of the exact directions on how to play Where Is Carmen Sandiego. Share with us your comments, funny stories, tips, advice, strategies, creative ways to play, questions about how to play, problems with the rules or anything you want about Where Is Carmen Sandiego. All submissions will be reviewed within 24 hours. Click here to add your Where In The World Is Carmen Sandiego comments.